This well-preserved abbey is picturesquely sited among the grey hills of the Burren. It is best known for its lonely situation, lying close to another interesting monastic settlement, a group of three small early Christian Churches which nestle in the pass of Oughtmana and which are dedicated to St. Colman. These early monks give us an idea of how they sought out isolated areas in which to build their churches, and then set about the task of becoming self sufficient and maintain themselves free from contact with outside society. The abbey acquired the name of 'Sancta Maria de Petra Fertili'- 'St. 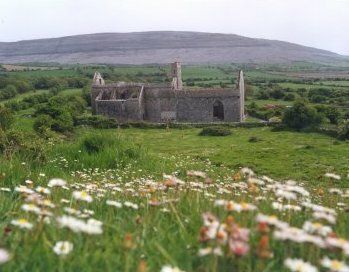 Mary of the Fertile Rock' which reflects the fertile nature of the Burren lands, which insured that here a Cistercian community could, by cultivation, provide itself with the necessary means of support. 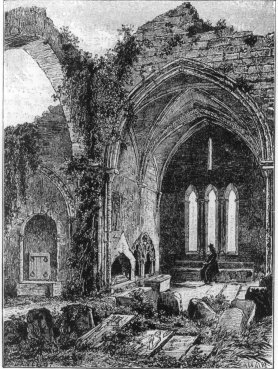 Corcomroe Abbey is said to have been built by Donal Mór Ua Briain, late in the 12th century and he was also responsible for several other important religious houses in Thomond which include St. Flannans Cathedral in Killaloe, St. Mary's Cathedral in Limerick and Holy Cross Abbey. His selection of this site in the Burren appears to have been a prudent one for the abbey continued to function for the next 400 years, the last Abbot named in 1628, being Revd. John O'Dea, a Cistercian from the Irish College at Salamanca. The abbey was built to a cross-shaped design with each transept having a chapel, the entrance to one now being unfortunately sealed off for burials, but the magnificent groined entry arches are still visible, which display some fine outer mouldings. Many other architectural features and motifs of interest may be seen. The choir is constructed in stonework of a very high quality, with the roof bearing some finely carved rib vaulting in the Romanesque style, while the capitals are decorated with leaves of the lotus plant and other botanical species. Further interesting images are displayed in the transept chapels which include human masks and dragons' heads carved with great ingenuity. In the north wall of the choir there is a tomb-niche holding a recumbent effigy of King Conor na Siudaine Ua Briain one of the very few examples remaining of an Irish Chieftain. This monument shows the king wearing a crown decorated with fleur de lys, the left hand holds a sceptre and the right a reliquary suspended from the neck of the figure. His robe falls in long pleats to below the knee while the figure appears to lie on a cloth with the feet resting on a cushion. King Conor was a grandson of the founder, a benefactor of the Cistercian Order and he was laid to rest here in 1267. It was customary of the Cistercians to divide their churches into two parts by a screen across the nave. To the east was the monks choir and to the west the choir of the lay brothers. Here at Corcomroe this screen was erected near the massive cross-wall during the later middle ages. After the dissolution of the monasteries in 1554 the Abbey was granted to Murrough O'Brien, Earl of Thomond, and after 20 years it passed to Donal O'Brien, the last native prince. Throughout these centuries it would be difficult to imagine the impact which this abbey had in a district which had never seen a church of such grandeur before. During all its vicissitudes which included local upheavals and violent clashes among nearby clans, the monks and lay brothers continued to tend to their fields and maintain their abbey to the best of their ability.